William Mariner : Surf Riding in Tonga, 1810. Constable and Company, Edinburgh, 1827. 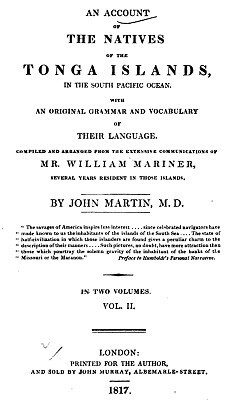 "William Mariner (1791–1853) was an Englishman who lived in the Tonga Islands from 29 November 1806 to (probably) 8 November 1810. He wrote an account of his experiences, Tonga Islands, that is now one of the major sources of information on pre-Christian Tonga." - wikipedia: William Mariner, viewed 3 May 2013. 1810 George Vason : Body Surfing in Tonga. Fanifo swimming in the surf. This bold and manly exercise has been well described by Cook as seen by him at the Sandwich Islands; but the natives of Tonga use no board. the distance of seventy yards, the party who carries the stone running along the bottom. The difficulty is to pursue a straight course : a person may thus run much faster than another can swim. Fanifo. The art of swimming in the surf. Foonga. The beach, the deck of a vessel, the top or summit of a hill where it is flat : the top of any thing. Gnaloo. A billow, surf, surge. Tee. To swim, to float. Teetee. A float, to be buoyant. Geoff Cater (2013) : William Mariner : Body Surfing in Tonga, 1810.